Our normal delivery period is 5 to 7 working days, weekends and bank holidays are not classed as working days, using Royal Mail. Orders should be received within a maximum of 14 working days. Any claims for lost goods will not be entered into until after 15 working days from dispatch. If you do require next day delivery please contact us via email and we will do our best to meet your requirements although there may be extra charges incurred. We do not pay the postage costs of returns. We endeavour to check that the quality of all orders shipped meet the high standards that our customers expect. On receipt of your order and payment clearance we will dispatch your goods as described above. Once goods have been dispatched we will advise you by email. If your chosen goods are out of stock or no longer available we will advise you by email. 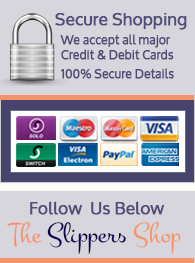 If we cannot meet your requirements we will credit your method of payment. In the case of orders greater than 1 pair of shoes goods may be dispatched at different times. Delivery will only be made to the cardholder’s registered address or the cardholders place of work which may need to be verified before dispatch. We will not in any circumstances delivery to any other address. Please note that for any items that are returned to us by Royal Mail as uncollected from their sorting office, we will not provide a second free delivery for customers who would still like the order. We will contact the customer for the delivery charge before we dispatch it a second time.